Authors: Shankman C., Kavelaars J. J. et al. Dubbed as one of the “Wildest Alien Planet Discoveries of 2016“, Planet Nine was a truly exciting prospect for all planet lovers alike. 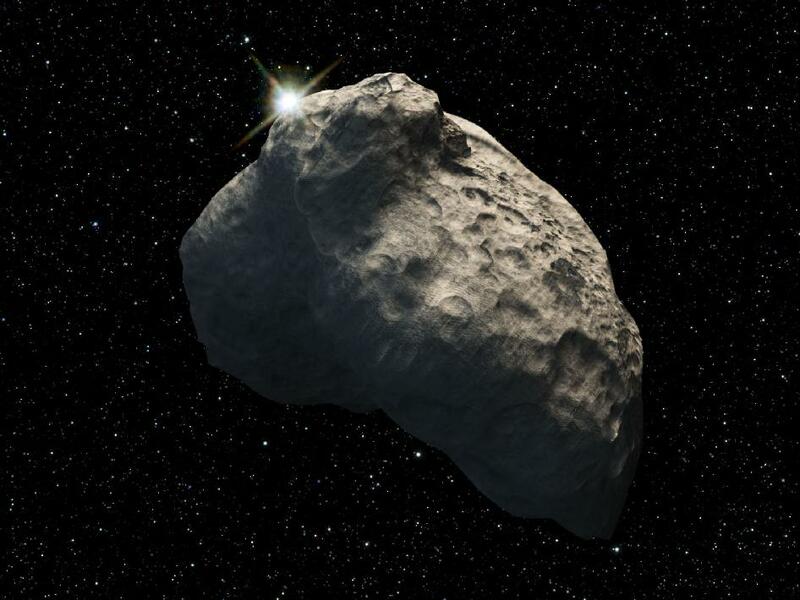 Unfortunately, the line of evidence for this elusive planet lurking in the outer reaches of our Solar System has been called into question recently by the study discussed in today’s bite. The hypothesized Planet Nine is an icy and bigger analogue of Earth (about ten times as massive, and almost the size of Neptune or Uranus) on an orbit with a period of 15,000 years, and an aphelion (farthest approach from the Sun) ~1200x as far away as the Earth from the Sun. This far-off region, wherein Planet Nine spends most of its time, belongs to the Kuiper belt, and is observed to be populated by mini planet-like icy bodies known as trans-Neptunian objects (TNOs) that have been left over from the relic of the early Solar System formation. Since the early 2000s, researchers have noted that the long-period TNOs are not uniformly distributed in space. Instead, a number of these TNOs are found on orbits that are quite eccentric, with large semi-major axes, and clustered together in two distinct bundles relative to other TNOs. To explain this, scientists recently performed simulations and suggested the presence of an additional planet a.k.a. Planet Nine, which if exists, could have perturbed the original orbits of these TNOs and clumped them together in space (see Fig. 1). With the discovery of more such TNOs, and the understanding of their exact path around the sun, the idea of clustering, and hence Planet Nine, can be tested. So, are there any clusters? Over the last four years (2013-17), a large mapping survey known as the Outer Solar System Origins Survey (OSSOS) using the Canada-France-Hawaii Telescope to look at eight different patches of the sky, has taken a tremendous leap in the direction of finding more TNOs (see Fig. 2). During its tenure, the survey discovered more than 800 new TNOs, eight of which possess the long-period properties that could show evidence for or against the existence and effects of Planet Nine. With the help of these eight “special” TNO discoveries, Cory Shankman (an OSSOS researcher) and his team try to shed some light on the matter by performing an independent test of the idea that a long-period massive planet is shaping the outer solar system. Cory and his team report, in today’s paper, that the eight OSSOS detections have orbits oriented across a wide range of angles, and are statistically consistent with those drawn from a random distribution. Additionally, one of the observations sits at right angles to the previously proposed clusters thereby significantly reducing the odds that a tight spatial clustering in the orbits of long-period Kuiper-belt objects exists. Figure 2. A top-down view of the Solar System depicting the schematic of OSSOS pointings (solid gray), orbits of four of the detected long-period TNOs (red, green, cyan, yellow), and Neptune’s orbit (blue); Figure 5 in the original paper. As part of their analysis, the team also simulated the orbits of a uniform spread of tens of thousands of distant TNOs to test which bodies would be visible to their survey and found areas of the sky, like the dense star fields of the Galaxy, where certain orientations of TNO orbits become very hard to detect. Based on their findings, the OSSOS team argued that detection biases resulting from a combination of atmospheric variations (affecting the depth of observation) and ease of discovery in sparse parts of the sky could have led to false indications of clustering in previously published studies, which in turn weakens the case for the existence of Planet Nine. 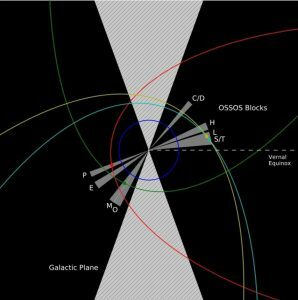 According to the team, the OSSOS survey was not designed to exclusively look for long-period TNOs, and hence their results cannot definitively prove, or rule out, the existence of Planet Nine, but “substantially weaken the evidence that has been used to justify the need for an additional very massive planet in our Solar System”. If the previous data was indeed unbiased, incorporating these new objects in the original simulations might lend more confidence to the hypothesis. 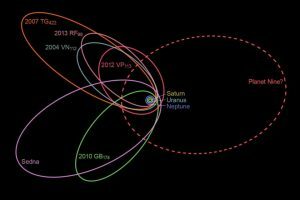 However, the final word will perhaps come from a direct detection of more long-period TNOs through a dedicated survey, or of Planet Nine itself, if it exists, as scientists continue to work hard on pushing the boundaries of how far out we can look. And even if there is something 10 times as massive as Earth out there, it’s not a real planet, merely a Dwarf Planet, until they prove that it has cleared its orbit. In the olden days when we thought it was as big as Jupiter, we were estimating a madnitetude 22 object. Now we think it may be as small as 105 earth masses, and the astronomers are postulating only 10 Earth masses. U of Az astronomers have computed planet Nine’s orbital inclination to be either 18 or 48 degrees, and we have computeted our Vulcan’s orbital inclination to be 48.44 +/- 0.23 (two sigma) degrees. This suggests that our Vulcan is their planet Nine.